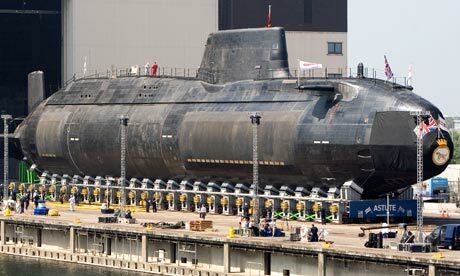 HMS Artful’s sister submarine Astute at the BAE Systems shipyard in Barrow-in-Furness. The nuclear safety watchdog has blocked the launch of the Royal Navy’s newest reactor-driven submarine because of a risk that a dockside could collapse. The Office for Nuclear Regulation (ONR) has barred the launch of HMS Artful, the third of Britain’s Astute-class hunter-killer submarines, because of doubts about the structural integrity of the wet dock quay at Barrow-in-Furness, Cumbria. The submarine’s manufacturer, BAE Systems, had previously planned for a launch this year but now says it will be early next year. It said the problem with the dock would not cause further delays. ONR raised its concerns in its quarterly report on the Barrow shipyard covering April to June 2013. It has ordered BAE Systems, as the site licensee, to investigate and report back on whether the dock was safe to use. “ONR placed a hold point on the launch of the next Astute-class submarine which will only be removed once the licensee can address and justify the continued use of the aging wet dock quay,” the report says. In a report about a visit to the Barrow yard by the Duke and Duchess of Cambridge in April, BAE Systems said Artful was due for launch this year. The first two submarines in the much-delayed £9.75bn fleet, HMS Astute and HMS Ambush, are at sea and another four are still being built. This entry was posted in UK Submarines and tagged Astute, BAE Systems, Barrow in Furness, HMS Artful, Nuclear, Office for Nuclear Regulation, ONR, Structural Integrity, Submarine on September 6, 2013 by jasonlockley. EXTENDING the life of Barrow-built nuclear submarines would not be safe, a top politician has claimed. Defence secretary Phillip Hammond made the admission in response to a parliamentary question asked by Barrow and Furness MP John Woodcock. There have been fears that the government’s Trident Alternative Review could recommend a further delay in bringing in new submarines, a move that would risk leaving a gap in the order book at Barrow shipyard. The coalition government has already ordered a four-year delay to the in-service date of the successor deterrent boats, meaning that the existing Vanguard class vessels will have served for a record 35 years before they retire. Following a question from Mr Woodcock in the House of Com mons, Mr Hammond confirmed the life of the hulls of the Vanguard submarine fleet cannot safely be extended beyond their latest retirement date, which for Vanguard – the oldest of the boats – is 2028. Speaking after receiving the response, Mr Woodcock said: “This clear view from the MoD that it would be unsafe to further extend the life of Vanguard should knock on the head any idea the government could put yet another delay into the build programme at Barrow. “Aside from the extra cost and disruption that another delay would cause, we cannot countenance asking the sailors who bravely provide Britain’s nuclear deterrent to serve in life-expired, potentially unsafe hulls. This entry was posted in UK Submarines and tagged Barrow in Furness, Deterrent, Philip Hammond, Trident, Vanguard Class on June 23, 2013 by jasonlockley. A Vanguard class nuclear submarine, carrying Trident nuclear missiles. The two pro-Trident MPs hope Ed Miliband will resist pressure to support the downgrade the deterrent. As Labour embarks on an intense debate on the future of Trident, a former aide to Gordon Brown has joined forces with a frontbencher to declare that the party would look “dangerously weak” if it diluted Britain’s nuclear deterrent. John Woodcock, who served as the former prime minister’s spokesman, and Angela Smith, the shadow deputy leader of the Commons, issued their warning as senior figures in the party urge Ed Miliband to use a government review of Trident to support a smaller deterrent. The pro-Trident MPs express the hope that Miliband will resist pressure for Labour to change tack. Labour has been a wholehearted supporter of Trident for the best part of 20 years after it resolved a bitter debate in the 1960s, 70s and 80s between advocates of unilateral and multilateral disarmament. The intervention by Woodcock and Smith comes on the day CND holds a rally against Trident at the Aldermaston Atomic Weapons Establishment and after members of Labour’s anti-Trident wing recently briefed the FTthat the leadership is open to a downgrading of the deterrent. The wing is hoping to seize on the government review led by the Lib Dem Treasury chief secretary, Danny Alexander, which is examining alternatives to Trident. The Lib Dems have raised the possibility of a land or air-based system or carrying smaller nuclear warheads on cruise missiles aboard Astute class submarines. The Conservatives are committed to replacing Trident with a “continuous at-sea deterrent” (CASD) in which, similar to current practice, nuclear warheads on intercontinental ballistic missiles are carried on four Vanguard-class submarines. The key decision on a Trident replacement, known as the “main gate”, has to be taken in 2016. This is when Britain will have to decides whether to spend between £25bn and £30bn on replacing the four Vanguard-class submarines, which are due to be taken out of service in the mid 2020s, with a Successor class. The Trident missiles are due to remain in service until at least 2042. The timing of thate “main gate” decision means Trident could be a major issue in the 2015 general election. 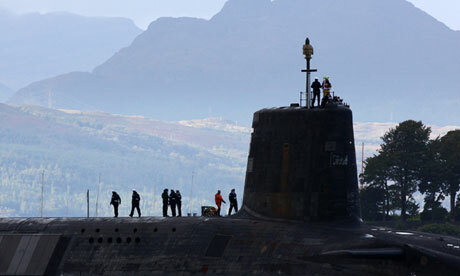 Labour opponents of Trident are hoping to find common cause with the Lib Dems. Woodcock is MP for Barrow-in-Furness, where the Successor submarines would be built. Many of Smith’s Penistone and Stocksbridge constituents work at Sheffield Forgemasters, one of the companies that would make components for the new submarines. The Labour leadership, which is wholly committed to maintaining Britain’s nuclear deterrent, is keen to take the Lib Dem review seriously. It could opt for a mild change such as agreeing that the Successor submarines would number just three, an idea suggested at one point by Gordon Brown. The leadership may support reducing the number of warheads on board the submarines following reductions in 1999 and 2010. This would allow Britain to make a contribution to disarmament. But it is wary of some of the most radical proposals being examined by the Lib Dems such as placing nuclear warheads on cruise missiles on the smaller Astute submarines. This entry was posted in UK Submarines and tagged Barrow in Furness, CASD, Continuous at sea deterrent, Labour party, Trident, Vanguard on April 1, 2013 by jasonlockley.